July 26, 2017, 11:12 a.m.
Google tops YouGov BrandIndex’s first-ever global brand health rankings. In a list dominated by online brands, the search giant comes in just above sister company YouTube as well as number three, Facebook. Other tech firms feature prominently on the list. Device manufacturer Samsung comes in fourth, messaging service WhatsApp in fifth and Apple’s iPhone in sixth spot, while online retail behemoth Amazon is seventh. The top ten is completed by brands with longer histories – Toyota, Adidas and Colgate. The rankings are based on YouGov BrandIndex data from across the world. BrandIndex operates in 32 countries across the globe, covering markets in North America, South America, Europe, Africa, Asia and Australasia. YouGov used the Index score for the list which assesses overall brand health. It takes into account perceptions of a brand’s quality, value, impression, satisfaction, reputation and whether consumers would recommend the brand to others. Tech brands dominate this global list and with good reason. By their very nature the likes of Google, YouTube and Facebook are open and accessible in most places on earth to anyone with online access. The presence of Samsung and Apple iPhone are a sign that our mobile devices have become the remote controls for our lives. All of the brands in the ranking are mainstream with broad utility at their core – and this is as true of the likes of Toyota and Colgate as it is for WhatsApp and Samsung. 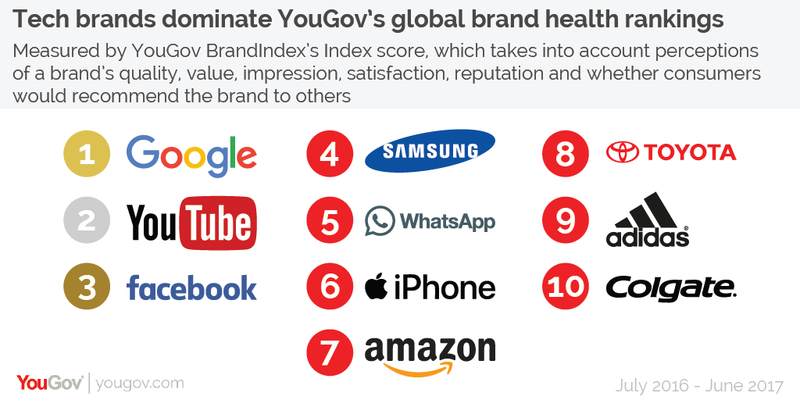 In parallel to the top ten global list, YouGov has also released UK brand health rankings. The list is dominated by higher end retailers – John Lewis and Marks & Spencer – as well as BBC-related brands – iPlayer, BBC One and BBC 2. It should be noted that all of the data for the list was compiled before the BBC published its pay figures. 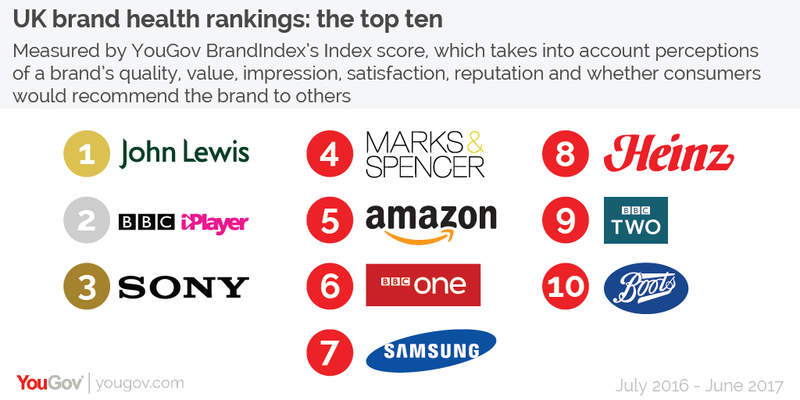 Two brands from the global rankings also feature in the UK list – Amazon and Samsung – while the other three places are filled by tech giant Sony, food brand Heinz and pharmacy chain Boots. While the global rankings are dominated by brands born in the past 20 years, the UK list is predominantly made up of ones that have been around a good while longer. 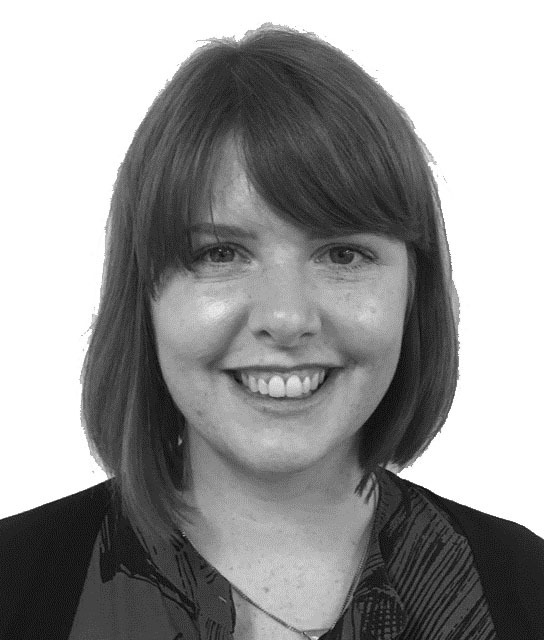 What is striking is that brands such as John Lewis and the BBC have successfully moved with the times – providing services in online settings while continuing to make a virtue of their brand heritage. The collapse of some big high street brands in recent years shows that this is no easy task, but as the UK faces an uncertain economic environment, having brand health steeped in history could help. 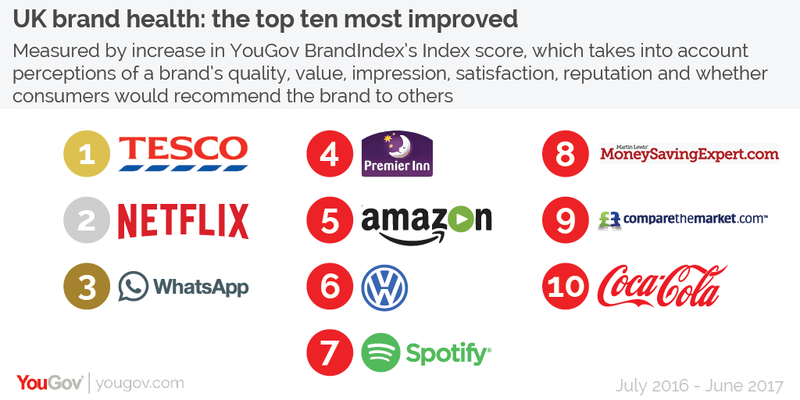 YouGov has also released a list of the brands with the most improved brand health over the past year. While the likes of Tesco and Volkswagen continue to strengthen their brand health after some turbulent times, the strong showing of streaming services Netflix, Amazon Prime Video and Spotify point to the continuing shift in how consumers access entertainment and that these brands are now firmly part of the mainstream.